The local EP that launched the career of the iconic '80's pop/R&B/dance band. Includes the rare "American Version" of the smash hit "I Can't Wait." 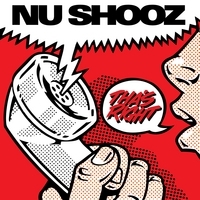 In 1984 Nu Shooz was one of the hardest working bands in the Northwest corner of the United States. The group, formed in Portland Oregon in 1979, was playing over three hundred days a year, traveling in a converted school bus. By this time the line-up had slimmed down from twelve members to seven. Manager Rick Waritz decided it was time to shop for a record deal. The band was changing. A year earlier percussionist Valerie Day replaced David Musser as lead singer. NuShooz was wandering stylistically too. There was an exodus of members, so by 1984 the Shooz were once again firmly under the control of bandleader John Smith. Tha's Right is a transitional album. Waritz said, "We need to go into the studio and record something." "I don't have any songs I like," Smith said, "Except for 'I Can't Wait.' That sounds real." A local music critic named Attilio called the live band 'boring,' (translation; not new wave enough,) but praised Tha's Right. "The album is surprisingly good," he wrote. "But local Top-40 Radio will never play it". Morning jock Gary Bryant of KKRZ Portland read the review on the air. He said, "If you're out there listening, come on down!" Waritz hopped on his Vespa and rushed a copy down to the station. They put 'I Can't Wait' on the air within the hour. The phones lit up. Recorded June – December 1984 at Cascade Recording, Portland OR. Engineered by Fritz Richmond except “Don’t Turn Back” – recorded Jan. 1984 at Fresh Tracks. Jon Lindahl engineer. Special Thanks to Mom, Dad, and anonymous Italian benefactors (who turned out to be Llloyd and Patti Babler). NOTE: This album was lovingly restored from decades old analog sources. Since analog tape can suffer from natural decomposition over the years we hope you will enjoy this classic material and forgive any imperfections that result from the effects of time.